IndiGo has sought the hand of Air India, but its investors are clearly not in favour of the alliance. InterGlobe Aviation Ltd’s share fell by 7.7% on the National Stock Exchange (NSE) in two days after its overture became public. IndiGo’s investors do have a point. In an industry where making losses is commonplace, IndiGo has set a record for making profits even in tough times. Its profitability and financial profile can make any airline envious. Revenue in the financial year 2017 was Rs18,580.5 crore, while its net profit at Rs1,659 crore was the highest among the three listed airlines. According to its March quarter presentation, IndiGo had total cash worth Rs9,343 crore and debt of Rs2,596 crore on its balance sheet as on March end. Its debt to equity ratio was around 0.7 time. Its latest market capitalization was Rs42,124 crore. All of this means it has the ability to fund a large acquisition. To be sure, the outlook for airlines isn’t too bad. Crude oil prices remain down. Domestic passenger growth is decent. IndiGo derives a major proportion of its revenue from flying in the local skies. Industry yield (pricing) is expected to remain stable or improve this financial year, supported to some extent by a favourable base. Air India is a different story altogether. Its financial metrics are miserable. Cast your eyes on the chart alongside. 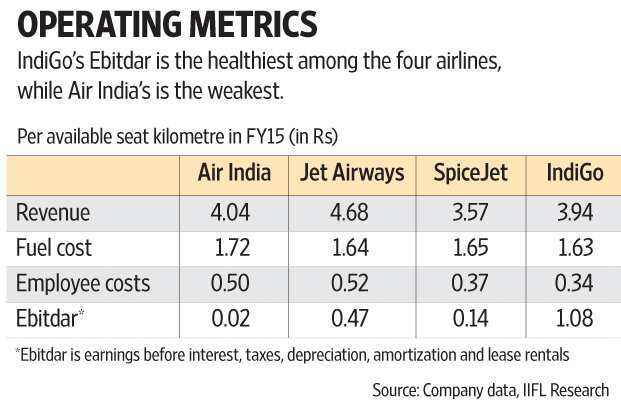 Sure, Air India fares better on revenue per ASKM (available seat kilometres) compared with IndiGo but, on other measures, IndiGo beats Air India, especially by a big margin on Ebitdar. Ebitdar stands for earnings before interest, taxes, depreciation, amortization and lease rentals, and is an important measure of profitability for airlines. When you are super-efficient and are planning to pick up something super-dull, investors will get worried, said an analyst with a broking firm who did not want to be named. IndiGo investors must be chiefly worried that acquiring Air India may deteriorate its financial metrics and adversely affect valuations. With loss-making operations and a debt of around Rs50,000 crore (despite many rounds of equity infusion by the government), Air India is not an ideal acquisition target, pointed out a report from IIFL Institutional Equities. “Even if the contours of the deal take care of balance-sheet stress, operational inefficiencies may be difficult to iron out," added IIFL. Additionally, dealing with labour union-related challenges can be a tall order for IndiGo. The fleet is different, too; IndiGo has a single type of aircraft, unlike Air India which has a fleet of different makes. Air India’s international operations can prove to be a good fit for IndiGo’s domestic-focused portfolio. IndiGo may take years to build the kind of international presence Air India has, as IndiGo’s current fleet may not be best suited to cater to such destinations. Slots at major international airports, too, can prove to be valuable. Further, Air India’s financials may be improving, in line with the trend seen in other airlines, helped by fuel cost savings thanks to a drop in crude prices. Be that as it may, given the issues and the preliminary stage of Air India’s proposed sale process, a lot depends on how this deal will be structured, if it happens, and most importantly, the price. Till more clarity emerges, IndiGo investors are likely to remain a nervous lot.